If this blog were a book, I should have dusted. Thank god, this is no book, hence no dust, no silverfish or torn brittle pages that would be on an old book. No musty smell of old book too which anyway i would have loved. Shilpa Garg is one of India's premium blogger whose blog has a major social presence and influence. She must have made close to 2K posts. She is very consistent with blogging and her posts are very creative and full of content. I have learnt much from her like spine poetry, Drabble etc, and it amazes me how she crafts stories & thoughts within 55 words which are crisp yet so meaningful in 55ers. A voracious book reader who has taken up and fulfilled many a reading challenges despite her busy work schedule which involves travelling. Her keen observational skills has even given fodder for her blog. At times the various international blogathons she signs up, she has even written them from her journeys on train, from airport etc. Such is her commitment and she loves challenges and is very organised. Besides blogging, reading books...she loves baking and travelling. While blogs was where we connected, we took the connection offline and are connected through phone too. Our conversation over phone has strengthened our bond and now I feel she is one humble, intelligent friend whom I can count upon. I was only happy to make a guest post for her and here is my presence on A rose is a rose is a rose! about Kitchen Gardening. 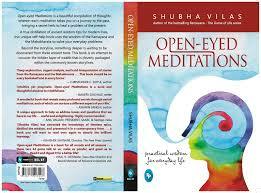 The moment I saw the title 'Open- Eyed meditations’ By Shubha vilas on blogadda book review program, my instinct said this could be my kind of book. The word ‘Meditation’ itself has a calming effect on me and the authors previous books on Ramayana which I read and reviewed here had left me pondering and contemplating even after I had finished reading those books. I expected this book to have a similar effect on me and, I must say I was not disappointed. Open-Eyed meditations was not a breezy read for me, I had to read and re-read at many many places to understand, accept and absorb what was written in the book. With the exams of my son and so many other commitments, it took time for me to finish the book. But, I enjoyed each and every page of the book. The book is actually a collection of thoughts about various aspects of modern life , the situations we deal with and offers profound insights and solutions to those situations . The way the author has beautifully drawn analogy between the situations we encounter in modern life to the stories or characters or situations from our epics The Ramayana or the mahabharatha is commendable. Each of the 64 is independant , complete and offers nugget of wisdom and action to be taken within the chapter to the modern day malady. At the end of each chapter is the summary highlighted in a box enclosure. The language is very simple and beautifully rhyming. Some of the lines can make great pin up quotes on hardboard or can serve as our status to inspire us. A few lines that inspired me are..
Like I mentioned, the book has many short stories embedded and while the author has elaborated the stories, situations and characters in many chapters, he has also missed completing them or he must have taken for granted that the reader knows the story. For instance, in the chapter “ A story about communication”. He talks about Kanika neeti in which Kanika convinced Duryodhana to have faith by narrating the story of a fox that tricked its four friends to part wth their share of the hunt by its cunningness. Elaborating the story crisply could have helped correlate the situation. The author says this story was the inspiration for the infamous gambling match. This passage left me curious to know what the fox story was. Otherwise, this is a marvelous book that takes us by the hand to deal with modern day situations. This book(279) is certainly not a one time read and has to be a part of our personal library and has to be picked up from the bookshelf often to absorb the brilliant insights.